The Elliston Community Website (est. Sept. 2000), welcomes you to the online representation of our town! We invite you to enjoy the Wonders of Elliston and unique experiences our town has to offer. The goal of this website is the general promotion our community as well as the preservation of our heritage. Although we are still the Root Cellar Capital of the World, our little town has grown beyond its root cellar fame (See below*). Today Elliston is becoming better known for its larger tourism value especially the puffin viewing site and the scenic Maberly Loop region that is also home to the unique Puffin Train display! Elliston has a replica front line trench (First World War) at the Discovery Shooting Club just outside of town. It was completed and opened on July 1st, 2014. This is a must see for those interested in Newfoundland’s military past and is 100% free to visit. The John C. Crosbie Sealers’ Interpretation Centre and Sealers’ Memorial Statue with a Memorial Wall overlooking the sea is also located in Elliston. If you are interested in the story of the seal hunt and artwork this is the place to go. One of this community’s premier assets is Sandy Cove. Here we have a beautiful sandy beach and located just across the road is Elliston’s Municipal Park with camping facilities. Also next door is the Gary Baker Memorial Campground with raised platforms for pitching tents. This is all within walking distance of the puffin site. All throughout the area there is magnificent scenery with excellent ocean vistas especially in the Maberly area. Sometimes, during the spring, we are treated to icebergs off our shores and during the summer a variety of whales can be seen around our coastline. *Note: Our previous web address, www.rootcellars.com, hosted the community site from September 25th, 2000 to March 31st, 2013. This website/address became its official successor on the latter date. We appreciate donations (see above button) that allow us to provide this community resource. The Puffin Train is a colourful yet unusual attraction located at Maberly a short distance past the actual Puffin Viewing Site. It is a large mock-up of a train from the fictional puffin railroad featuring the Puffin Express. It is one of Elliston's more humorous attractions especially for the kids and young at heart. 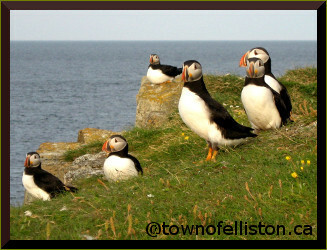 Elliston has one of the most accessible land view of puffins with hundreds of nesting pairs. This site is only a short walk from the main road and it provides some spectacular views of these colourful sea birds. Best of all it is 100% FREE! Puffins return to the site in May and stay until late in September. The root cellar was the initial item that put Elliston on the map. Things have come a long way since then. 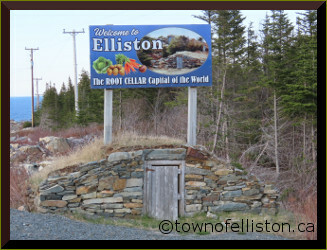 Elliston declared itself the "Root Cellar Capital of the World" in July 2000. 133 root cellars have been documented, some of which have survived nearly two centuries.